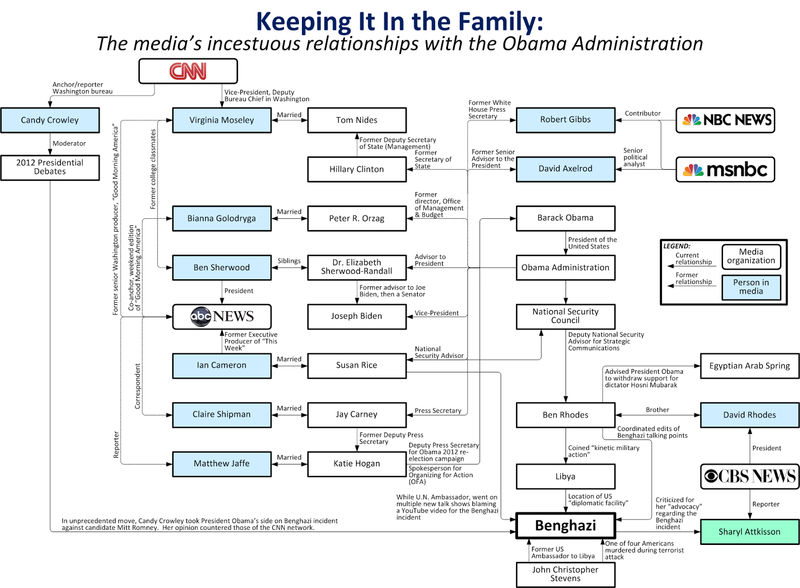 Thanks to the work of Crayfisherfiles, we have an at-a-glance chart available to trace the intermarriage of the Obama administration and the Alphabet networks plus CNN. It is a tangled web, in the Sir Walter Scott sense of the term ("Oh, what a tangled web we weave when first we practice to deceive.") Oddly enough, the only major television news source not implicated represented is Fox News, which has stood alone in defying the MSM norm of ignoring news that might politically harm any Democrat the Nation’s First Black President. I realize our format does not permit the chart below to be very legible, so please follow this link to get the full effect.